In June 2001, the Harris County Commissioners' Court approved a list of potential future toll road projects in the Houston area. This list is referred to as "pooled projects" since the rationale is that each project does not necessarily need to stand alone financially, but the pooled list of all projects is viable. The list includes a project which is already underway (the Westpark Tollway), a project which is imminent (Hardy Toll Road extension), two projects which are already under close study (the Katy Freeway Toll lanes and the Fort Bend Parkway), and a project which has been mentioned as a toll road candidate for years (the Grand Parkway). The list includes a couple surprises. 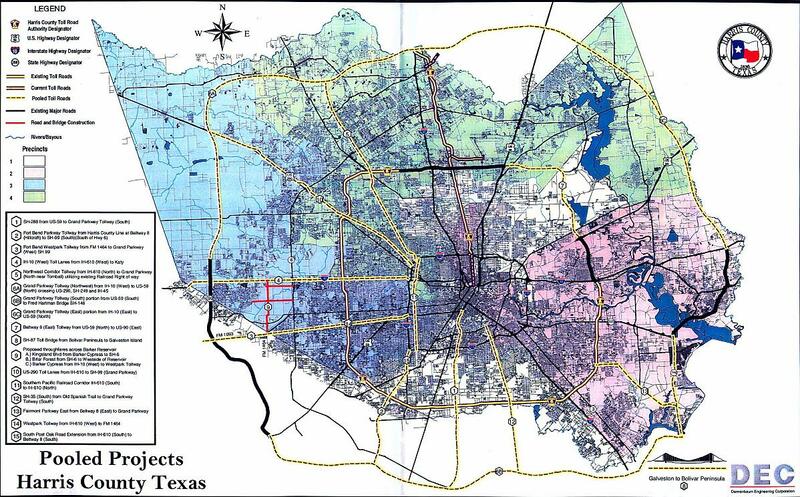 The biggest surprise is the inclusion of the Southern Pacific corridor parallel to Loop 610 West. This corridor faces huge challenges to any tollway construction and (in my opinion) probably won't be built. The second surprise is the inclusion of the northwest corridor tollway. I rate the section south of Beltway 8 as highly viable, but north of Beltway 8 there is no need for it. See my ratings of all the projects in the table below. 1 288 South Freeway from US 59 (downtown) to the Grand Parkway 33% This would be toll lanes in the wide median of the freeway. I don't see sufficient demand for express lanes within 25 years. The 288 corridor is still largely vacant, and it would be easy and relatively inexpensive to add general-purpose main lanes. 2 Fort Bend Parkway south of Beltway 8 90% This corridor has been under study for years and is now moving forward with recent bond approvals. But there is one potential hitch: generating sufficient traffic. This corridor is largely vacant, and traffic will be low until more suburbanization occurs. 3 Fort Bend Westpark Tollway 99% With bond money in place, this is just about a sure thing. 4 Katy Freeway Toll Lanes 70% This proposal is under study and has been well-received so far. But a close financial analysis could be a problem. The new Katy freeway will generally have 10 free lanes. Since the toll lanes will only be heavily used during rush hour, revenue could be low for many years. 10% (north of BW8) South of Beltway 8, this is natural extension of the 249 freeway and would be highly successful. North of Beltway 8, this corridor runs parallel and closely adjacent to the new 249 freeway. If the Hardy Toll Road teaches us anything, it's that tollways parallel to large freeways are financially questionable. I am skeptical of sufficient traffic to support a tollway on most of the Grand Parkway. The northwest section has the best chance of supporting a tollway. I rate it a 50% possibility of being a tollway. I still think there's a good chance regular funding (for a freeway) will become available. The south Grand Parkway traverses a totally rural area and would not have much traffic. The northeast Grand Parkway can't support a tollway within 25 years. 7 Beltway 8 northeast section 70% I expect this to become a tollway. This region is urbanizing, ensuring sufficient traffic flow. I expect the tollway to be in place by 2010, and maybe much sooner. The only possible concerns: insufficient traffic, and possible funding as a freeway. 8 Toll Bridge, Galveston to Bolivar 50% This bridge would cost approximately $243 million. Financial viability is a big question. If it is determined to be financially viable, look for the bridge to be built. 9 Barker Reservoir Arterials 90% It seems that the construction of these roads would be a public service, since I really can't envision how they would increase traffic on nearby tollways. I expect these roads to be built since they are needed. 10 US 290 toll lanes 70% There is currently a major investment study in progress. The preliminary recommendation should be released by the end of 2001. I expect reversible HOT lanes to be recommended, and HCTRA would probably take the lead on the toll lanes. 11 Southern Pacific corridor, IH-610 north to IH-610 south 25% This is the biggest surprise in the pooled list of projects. There is a huge need for a facility in this corridor to relieve IH-610. There would be plenty of demand for a tollway. But there are huge, probably insurmountable, obstacles. The corridor cuts through or near two NIMBY fortresses: River Oaks, Houston's most exclusive neighborhood, and Memorial Park. Houston's Metropolitan Transit Authority wanted to build an HOV lane in this corridor, but gave up due to opposition from River Oaks. In 1992, plans for expanding the West Loop were cancelled, with one of the main reasons the inability to acquire right-of-way through Memorial Park due to strong opposition from park promoters. 12 SH-35, Old Spanish Trail to Grand Parkway 33% This mostly-vacant corridor would need a large amount of urbanization before a toll facility could be justified. I don't see that happening within 25 years. 13 Farimont Parkway/Red Bluff Freeway 50% This corridor was originally planned as a freeway until cancellation in the 1970's. However, the feeder roads were built and the right-of-way is ready for a limited access facility. The main problem in this corridor is demand. I just don't see enough demand to support a tollway. A large amount of urbanization would need to occur, and this region should really not be heavily urbanized due to the hurricane risk. 14 Westpark Tollway 100% Construction has begun. 15 Post Oak freeway to Fort Bend Parkway 80% This would re-incarnate the Bay City Freeway. This section is essential to the success of the Fort Bend Parkway, in my opinion. I expect it to be built. I was disappointed that some corridors were excluded. For example, I would have liked to see a tollway along Highway 6 from Sugar Land to IH-10. (The section around Westheimer is already planned to be a freeway.) I would have liked to see a west and northwestward extension of the Hardy Toll Road, around the western side of the Woodlands. I would have liked to see toll lanes on the Southwest freeway. 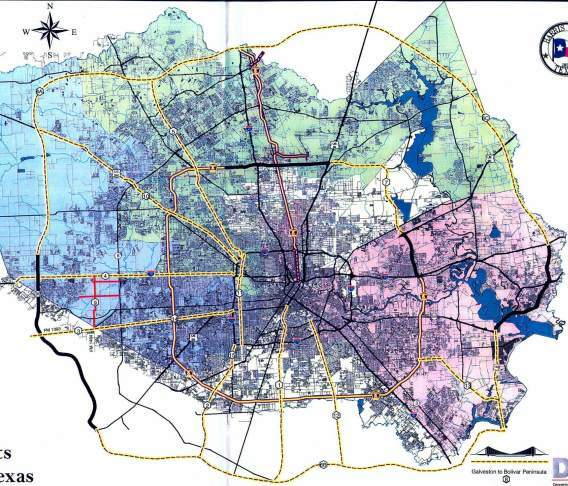 I'm also hoping that some of the corridors on this map are eventually constructed as freeways, primarily the Grand Parkway, but also the 35 freeway.